When you think about paying a visit to a garage, the first thing that comes to mind is probably something going wrong with the engine of the car, or a mechanical aspect such as the steering or braking system. The truth of the matter, however, is that car body repair can be just as important. While we’ve been offering MOTs and full services, and dealing with mechanical breakdowns, for many years, our offer is about to be enhanced with the opening of our state of the art car body repair centre. At first glance, a car body repair might seem like a fairly trivial matter, but we know from experience that it can soon become much more serious if it’s not dealt with properly. In the first instance, even a fairly small scratch or dent can impact upon the appearance of your car and, in turn, can reduce its value when the day come for selling it on. Even more serious is the fact that a scratch or dent can allow water, salt and other corrosives to attack the bodywork of your car beneath the paintwork. The rust and corrosion caused by this could eventually end up costing a large amount of money to put right, certainly much more than the cost of a visit to our car body repair centre. If you’ve got a dent, bump or scratch on your car and you’ve been putting off having it fixed then pay a visit to our car body repair centre at the earliest possible opportunity. Just like the rest of our Denton depot, the engineers working there will have years of experience in their chosen field and will be using the very best cutting-edge equipment. 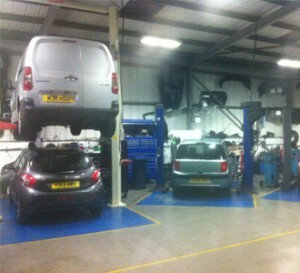 On top of that, you can be certain that we’ll carry out the car bodywork repair you need for the best possible price. That’s just one reason why so many of our clients come back to us time and time again and recommend us to their friends and family. Bring your car along to our car body repair centre and you’ll receive a friendly welcome and a completely honest explanation of the work that needs doing. Unlike some garages, we won’t attempt to take advantage of your lack of expertise, and we’ll make sure you know exactly what we’re going to do and how much it is going to cost you. If you’ve got a blemish of any kind on your car then contact us today or pay a visit to our car body repair centre in Denton. We’ll have your car looking as good as new in no time at all, and we’ll work to the high standards our customers have come to take for granted.